A pickle a day…..keeps the doctor away??? When I was younger my great-grandmother came to visit for a couple of weeks. While she was there I watched her peel and slice brocoli stems and place them in the pickle jar with old pickle juice. She would also drink leftover pickle juice. At the time I thought she was obsessed with pickles, and maybe just a little nuts. Little did I realize she was tapping into an ancient nutritional truth. I bet she didn’t even know what she was doing or why. It was simplly what she was taught and she was repeating that act (although the brine from store-bought pickles had zero nutritional value). Pickles weren’t always an item on the shelve in the grocery store, made by Claussen, Vlassic and others. To glimpse a time when pickles were a health food, you have to go back. Back before the grocery store pickles, back before the little housewife in the kitchen working hard to can her pickles. 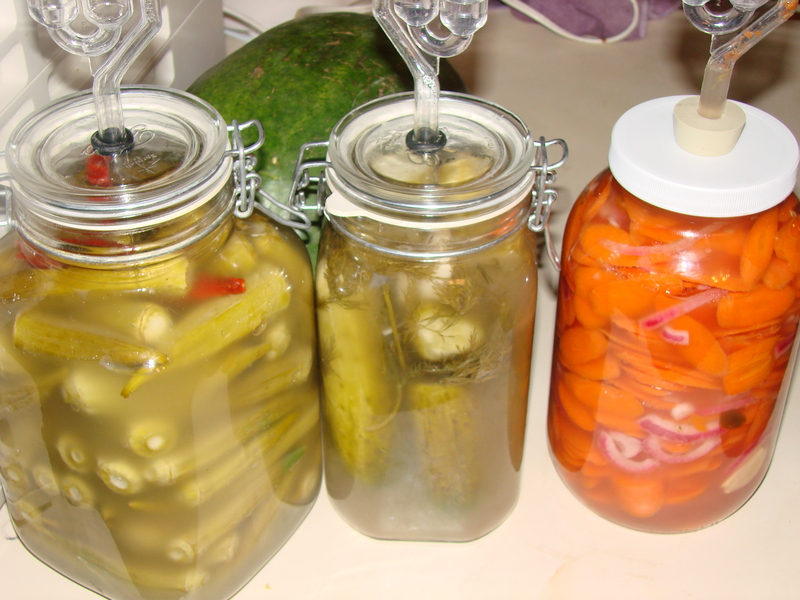 Originally pickles, sauerkraut and many other foods were made by a process called lacto-fermentation. Lacto-fermentation is how families preserved their food for generations. This was an art-form, handed down from mother to daughter throughout generations. So what happened? World war II. When all the able-bodied men went off to fight in world war II, the countries work force suffered. For the first time in our history, women were being told we were more valuable (or only valuable) working outside of the home. So we went to work. In drones, women joined the work force. All the sudden, there was no one in the home to do all the work that came with running a household. No one to make the bread or cook dinner, much less make the pickles. So the manufacturing industry stepped in – enter white bread and tv dinners! Pickles were a problem though. Lacto-fermentation can’t be done on a large-scale. It’s an art form, not an exact science. So they figured out a way to make something that “tasted like” pickles. The manufacturing industry discovered that canning pickles in vinegar created a similar taste and texture and that it could be done on a massive scale. And so was born the modern pickle. Most of the flavor and texture, none of the health benefits. So what makes pickles healthy? What is lacto fermentation? Lacto fermentation is a process that converts the sugars and starches in food into lactic acid. This occurs through the works of friendly bacteria. Now don’t be scared by the word “bacteria”. Our bodies need good bacteria, also called probiotics. This bacteria, and their by-product lactic acid actually improves the nutrition and digestibility of the food. So the process of lacto-fermentation increases your health beyond just the range of vitamin and minerals nutrition. It is like a boost to your digestion and immune system. So how about reaching for a lacto-fermented pickle to enjoy with your lunch tomorrow? Oh- and did I mention? They taste WAY better than brine and canned pickles. Yeah for healthy pickles! I’ll be posting some EASY lacto fermented recipes in the coming days. In the meantime- there is one small brand I know of that still uses lacto fermentation. Bubbies brand makes dill, bread & butter pickles, plus saurkraut. You can find it in health type grocery stores- Whole Foods, Sprouts, Central Market- ect. It will always be in the refridgerated section- because it is alive (like a yogurt). Check it out- you won’t be sorry!